Sometimes it seems the commercials during the Super Bowl each year are in direct competition with each other just like the two teams striving to take home the Lombardi Trophy. It is even more evident with automotive commercials, such as the one Audi will debut during Super Bowl XLVII featuring the all-new Audi S6 and a slightly insecure teenager about to embark on his Senior Prom journey. We have to say, this is a good depart from the abused vampire-themed genre of commercials in previous years. This one is pretty darn good. Enjoy! We don’t live in a one-size-fits-all world, and nowhere is that more evident than in the world of luxury cars. There are manufacturers who build sport sedans that handle well, but fall short in the ride comfort department. There are also automakers who coddle buyers with ample luxury, yet deliver as much excitement as a documentary on the evolution of the paper clip. In between these extremes lies Audi, which offers up an impressively diverse range of luxury and sporting automobiles. It’s point-of-entry A models serve up all the amenities that luxury buyers expect, including interiors that we consistently find to be best in class. While these A models lean more towards luxury than performance and handling, S Line accessories can be used to enhance appearance, even if they really don’t up the capabilities. The next rung of the Audi ladder is its S models, designed to offer up additional performance and improved handling without sacrificing luxury or ride comfort. If you still want an additional bit of schnell with your Audi, its RS models (limited to the TT-RS and the RS5 in the U.S., for now) give you maximum performance, at the expense of some ride comfort. 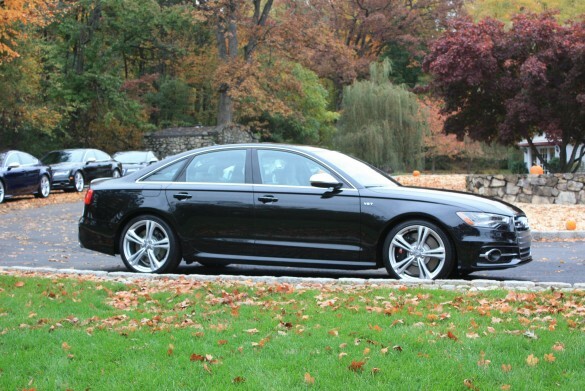 Audi’s S6 and S8 have been out of production as the models change generations, but both are back in the U.S. market for the 2013 model year. 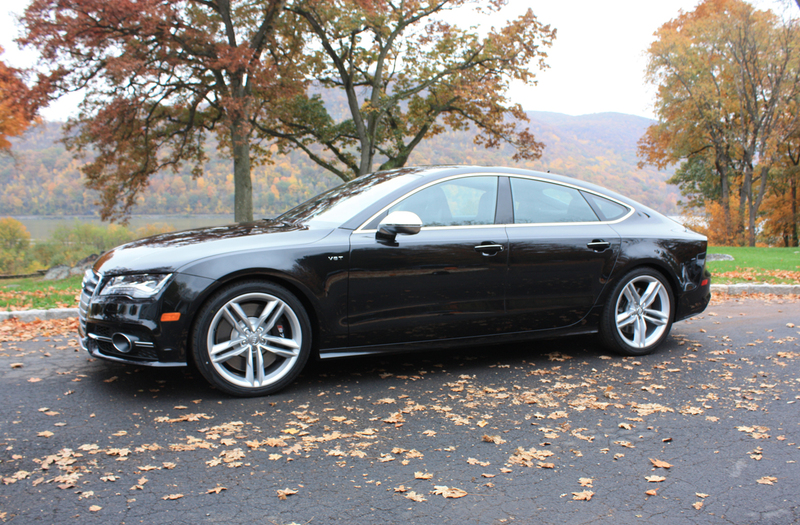 Joining them for the first time is an S version of Audi’s four-door coup, the A7. 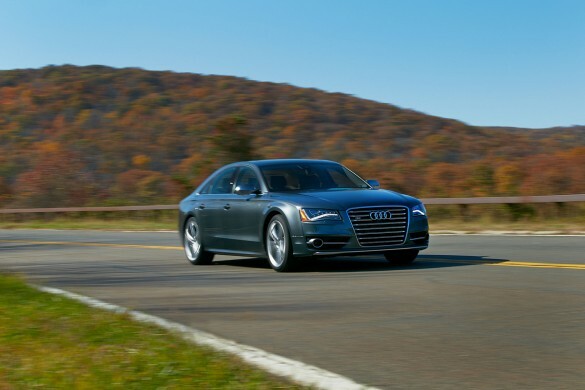 While the S6 and S7 share a platform and powertrain, the larger S8 gets a unique chassis and a heavily-revised version of Audi’s new 4.0-liter, twin-turbo TFSI V-8. In S6 and S7 duty, the 4.0-liter V-8 makes 420 horsepower and 406 pound-feet of torque and sends its output to all four wheels via a seven-speed S tronic transmission. The combination is good enough to produce a 0-60 mph time of 4.5 seconds, and launch control helps ensure that no thrust is wasted as wheelspin. Audi’s sport rear differential is standard on all S models, too, ensuring that post-apex acceleration is maximized, regardless of conditions. While the S8 also gets Audi’s 4.0-liter TFSI V-8, it’s significantly revised compared to the 4.0-liter V-8 in the S6 and S7. The most obvious change is dual air intakes, but internally the engine gets larger turbo compressors (resulting in higher boost), revised camshafts and different ECU programming. As a result, the S8 makes 520 horsepower and 481 pound-feet or torque, requiring the use of Audi’s eight-speed Tiptronic transmission to handle the additional torque. 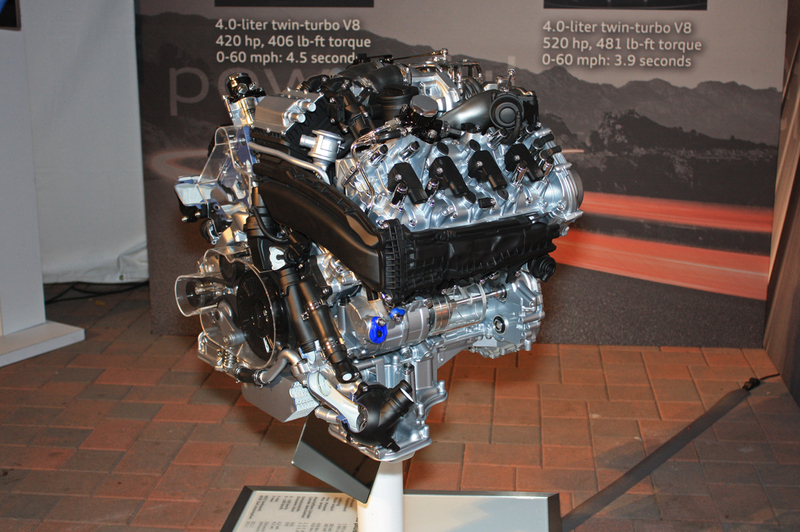 Despite the S8’s 4,641 pound curb weight, the uprated V-8 is powerful enough to get the car from 0-60 mph in under four seconds. The design of both 4.0-liter V-8s is absolutely ingenious, and the engine is currently the most compact turbocharged V-8 on the market. 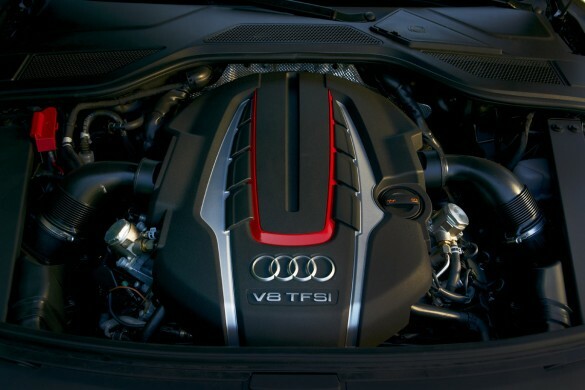 To maximize its use of space, Audi fit both twin-scroll turbochargers into the valley between the cylinder banks, and topped the assembly with the intercooler. The intakes are on the outside of the engine, where the exhaust plumbing sits on a conventional V-8. The exhaust exits from the inside of the cylinder banks, allowing Audi to place its catalytic converters as close to the escaping exhaust gasses as possible. 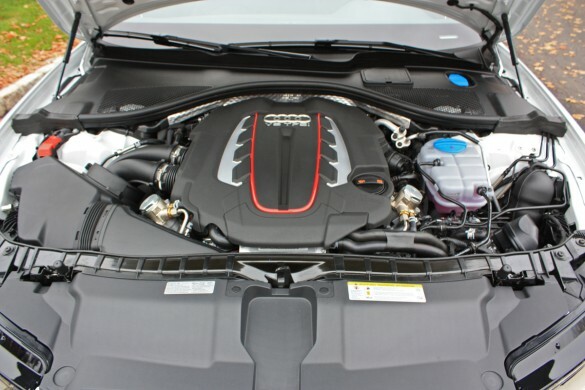 As a result, the engine reaches its ideal operating temperature more quickly, and Audi assures us that heat soak isn’t an issue thanks to the insulation used in the engine’s construction. Inside, S models give buyers all the luxury, connectivity and infotainment amenities they could want. Audi Connect transforms all S models into a T-Mobile wireless hotspot, and Audi’s navigation system works with Google Earth mapping and Google Voice location searches. 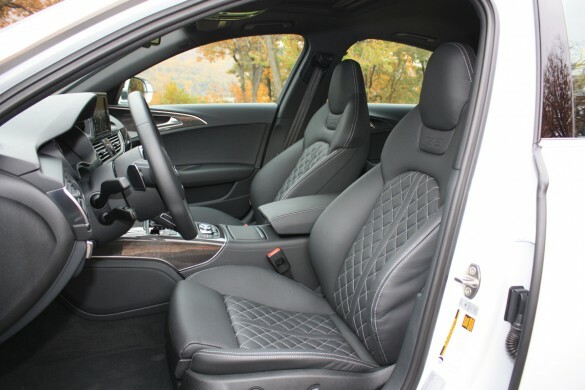 While the standard sport seats in the S6 and S7 are outstanding, the 22-way power-adjustable sport seats in the S8 are sublime; in fact, we’re fairly certain they’re our new favorites in the entire automotive world. The performance of each new S model is as distinctive as its appearance. While the S6 is the most sporting of the bunch, the S7 wins on style points and the S8 is nearly in a league by itself. 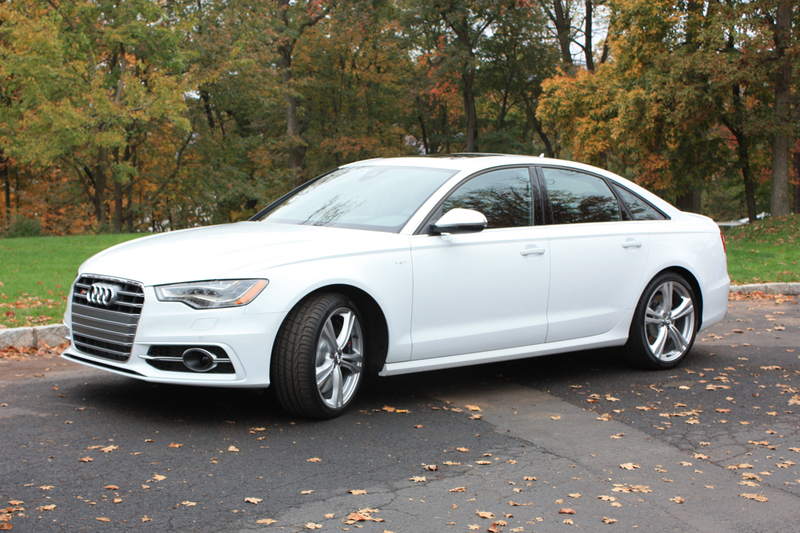 Despite being the largest of the bunch, the S8 drives a thousand pounds lighter, and its sure-footed acceleration is breathtaking. Put another way, nothing with the S8’s dimensions should accelerate so quickly, corner so confidently and stop in as short a distance. 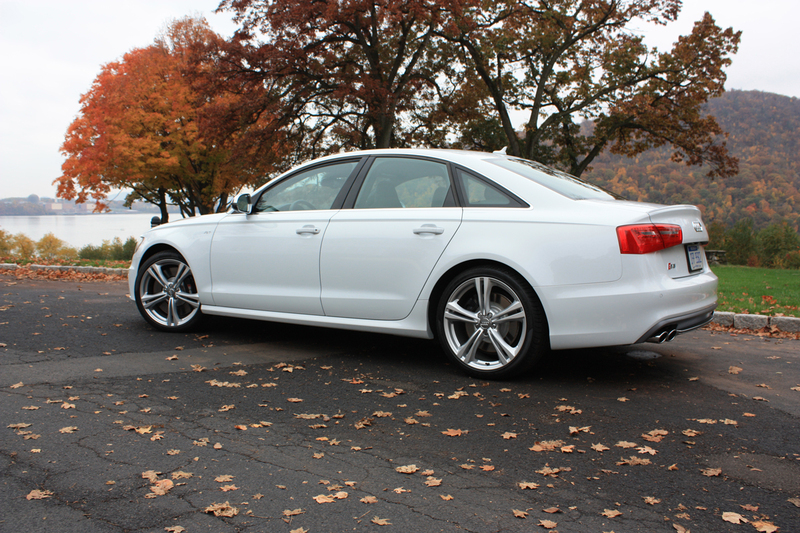 While all are exceptional luxury sport sedans, if we had to pick a favorite, it would be the S6. Perhaps the car’s smaller dimensions and lightest weight played to its advantage, but we suspect there’s more to it than that. Our guess is that Audi engineered the S6 to be a bit more aggressive and a bit more entertaining than the S7 and luxury-leaning S8, even if the performance numbers don’t indicate an appreciable difference between the S6 and S7. While all produced confidence-inspiring handling, grin-inducing acceleration and amazing braking abilities, the S6 gave us the highest level of feedback and seemed the most eager to be driven hard. 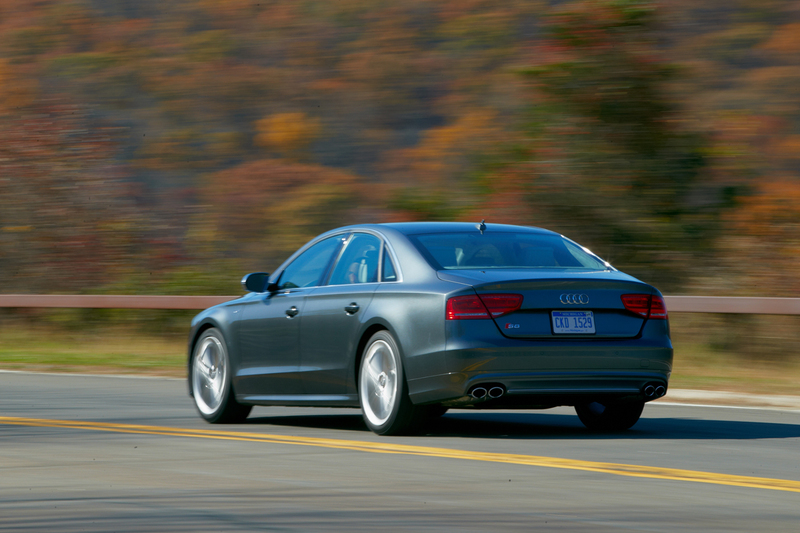 Maybe the fact that we drove the S6 after the S7 and S8 had something to do with it, but the S6 felt immediately familiar, and we were more comfortable testing the S6’s limits than we were probing those of the other S models. If you’re in the market for a mid to full size sport sedan, the S6 should be on your shopping list. 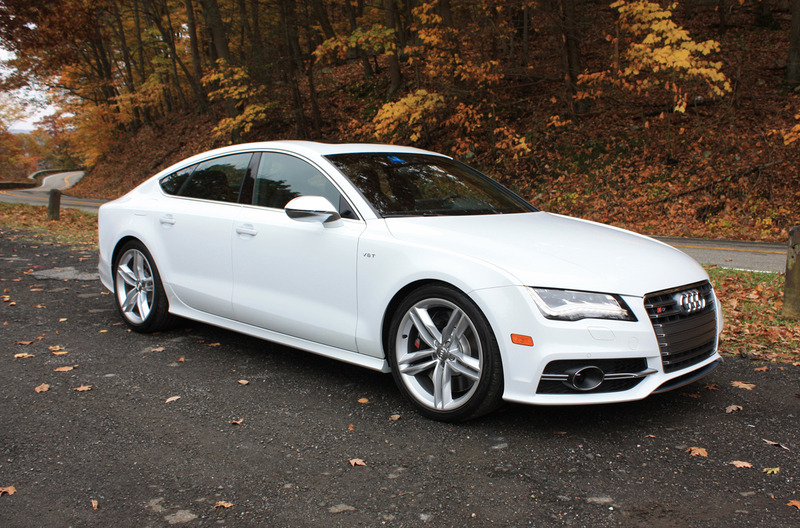 The S7 provides nearly the same performance, but throws in the added benefit of its fastback, four-door coupe styling. If you need more room still, Audi’s full-size S8 will not disappoint with delivered luxury or performance capabilities. Pricing on Audi’s new S models starts at $72,795 for the 2013 S6, $79,695 for the S7 and $110,895 for the S8. All come well-equipped, but all can be fitted with additional luxury amenities such as a Bang & Olufsen audio system, adaptive cruise control and an infrared night vision system. Disclaimer: Audi paid for airfare and lodging and gave us really nice swag, allowing us to bring you coverage of its new S models. We say that’s irrelevant, since we would have said the same things if we’d driven them in the press fleet.